Talk about pressure. Los Angeles, CAs Terrorizer released one album 1989s World Downfall  before quietly imploding. A blistering, raw grindcore affair, the album quickly became an underground classic due to its unforgiving extremity. And now theyre back with a new singer (Anthony Rezhawk of Resistant Culture), who does a more than admirable job barking and growling his way through this album. The rest of the classic all-star line-up is here: drummer Pete Sandoval (Morbid Angel), guitarist Jesse Pintado (ex-Napalm Death) and bassist Tony Norman (Morbid Angel, ex-Monstrosity), all of whom clearly know what theyre doing. But they tone it down for these songs, instead going for a raw, old school crust and grind approach. Sandoval is king of all beats fast, here proving his mastery with ample rolls, blasts and speedy scissor beats. The production is muddy and raw, fitting for the tunes. And given that about half these songs were originally written around the time of the first album  and one is a remake of the underground hit "Dead Shall Rise  the sound is largely the same as it ever was. Sure, the album has a slightly different vibe, with a bit of modern death metal in the guitars and drums, but times have changed and these are adults making this noise now. Dont worry though, they havent tamed it down a bit. 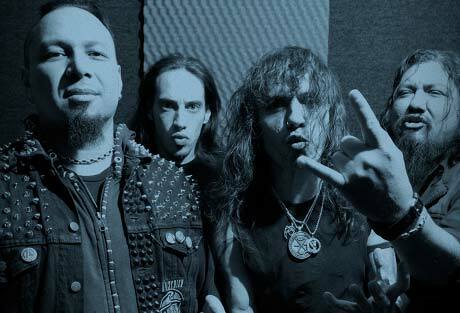 Why did you decide to reunite Terrorizer now? Sandoval: There were so many obstacles in the past, with Jesse in Napalm Death and me in Morbid Angel. Now that Jesse had nothing else to do, he said, "Now, lets do this. I was always asking him about it, but it was impossible because he was always in Europe. What do you say to anyone whos sceptical of the band getting back together and trying to recreate your old sound? Its been 17 years. Were getting older right here. Were maturing and the music is maturing too. How are we going to play something that sounds like we did 20 years ago? No way, dude. Listen to the way I play now, after being with Morbid Angel. These songs have double bass; before I never had double bass with Terrorizer.